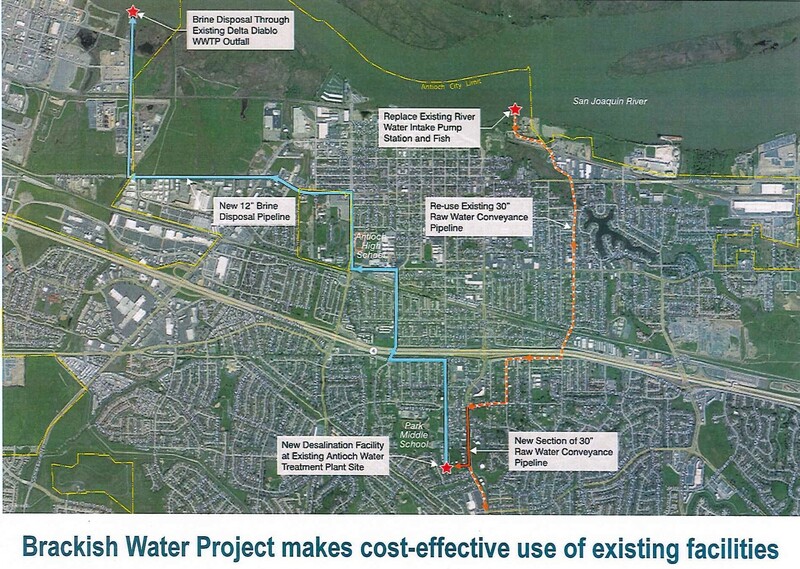 Map of current and proposed pipelines for the Brackish Water Desalination Project. Project consultant Walter Bishop, the former General Manager of the Contra Costa Water District, provided the background on the plant and efforts to get it funded. “We have hopes Antioch will be on the state funding list, which is expected to be announced this month,” he said. It takes treating 7.5 million gallons of brackish water to produce 6.0 million gallons of useable water, he shared. “With the new pump the city will have a variable speed pump which will be better for the city’s needs,” he added. Final design and permitting for the plant is expected to be completed in 2018 and the project could be online in late 2019 or early 2020, depending on securing funding. Councilman Tony Tiscareno was first to make a comment about the project report. The EIR (Environmental Impact Report) coming forward is for the 6-million-gallon desalination plant. Will a 16-million-gallon desalination plant fit on the site we’re looking at?” he asked. “We could be looking at the summer of next year for the funding?” Wright asked. “How are our relationships with the Contra Costa Water District?” asked the mayor. “I think our relationships over there are fine. I used to be the GM over there,” Bishop shared. “We’re kind of suing the state,” he said referring to the city’s lawsuit over the proposed Delta tunnels “Contra Costa Water is responsible…Your staff was very careful to not name both parties,” meaning CCWD and the state. Mayor Pro Tem Lamar Thorpe asked how the city can sell the water to create a revenue source for the city. “Your water rights allow you to divert 16 million gallons of water a day,” Bishop responded. The council then voted unanimously to receive and file the report. This entry was posted on Wednesday, December 27th, 2017 at 2:15 pm and is filed under News, Water. You can follow any responses to this entry through the RSS 2.0 feed. You can leave a response, or trackback from your own site. I’m debt but we’ll take on more debt in hopes some company might come into the ads that needs ultra pure water? What a pipe dream. No pun intended. I have had enough of this and this city living in the pie in the sky. My water bill has gone up $20 how is yours? Nothing ever goes down.